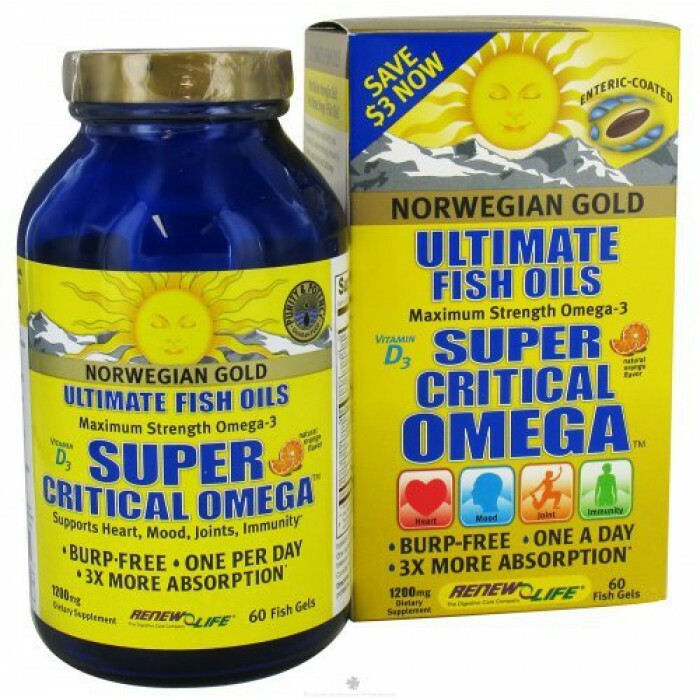 Norwegian Gold Super Critical Omega by Renew Life 60 Softgel Norwegian Gold Super Critical Omega Ultra-concentrated High-EPA Formula Provides Powerful Total-body Support Beneficial Essential Fatty Acids Ultra-concentrated Omega-3 fish oils 1 025mg Omega-3 in 1 softgel High EPA formula Helps protect against coronary heart disease Promotes healthy joints skin Helps improve mood Enteric coated for 3X more absorption With 1 000 IU of beneficial Vitamin D3 for mood skin and bone health Lipase helps reduce fishy burps Natural orange flavor Norwegian Gold Super Critical Omega is a maximum-strength Omega-3 fish oil supplement with 1 025mg Omega-3 per softgel for powerful total-body health support. The high-EPA super-concentrated oil blend supports healthy heart function and lowered risk of coronary heart disease helps reduce stiffness in joints and promote overall joint and muscle comfort and helps reduce anxiety and improve mood. Added Vitamin D3 supports cognitive function and bone health.